Scion’s Forest Research Herbarium houses the country’s largest collection of planted and indigenous forest tree species. Established in 1946, it is home to 30,000 catalogued, geo-referenced and securely quarantined specimens in a custom-designed vault. Each sample in the collection holds a wealth of information about the tree species - leaf samples, flowers, bark and fruit, along with information about where the tree was (coupled with a GPS reading), who took the sample and when, and a brief description of the plant. 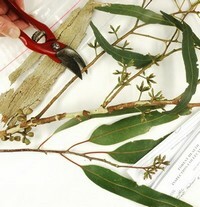 The herbarium runs a loan system where national and international scientists can borrow specimens for scientific purposes, and staff are often called on to identify plants particularly by biosecurity officers who monitor the health of the country’s flora. The collection is currently being photographed to expand the online database and make it more readily available.